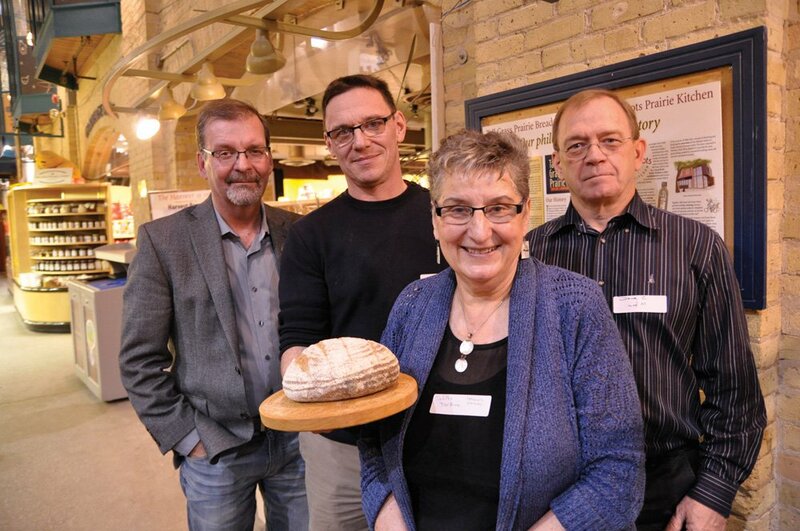 Guests at a small reception at the Tall Grass Prairie Bakery in downtown Winnipeg Nov. 23 were treated to loaves of freshly baked sourdough bread made with Kernza, the trademarked name for a perennial grain that has been developed from intermediate wheatgrass, a crop more commonly used as forage. The flour was brought in for test baking from the U.S. where the crop is currently in small-scale commercial production and being used to make bread, crackers, designer beers and even a whiskey. The Kernza flour had to be blended with other grains to produce the crusty bread loaves because its gluten quality makes it more suitable to making crackers. Kernza is a perennial cereal, which could potentially boost the sustainability of annual crop farming. As a perennial, it is left intact for up to five years, yet still provides an annual seed crop to harvest. “Manitoba is almost a perfect place to grow this,” said Doug Cattani, the plant breeder managing the Manitoba breeding program. The region gets enough moisture during the summer and winter; a healthy snow cover is needed to insulate the dormant plants through the cold Prairie winters. If left intact for several years, Kernza develops roots that reach up to 12 feet deep into the soil, improving moisture infiltration and supporting a vibrant microbiological ecosystem below the surface. That rebuilds organic matter, much of which has been lost from Prairie soils since pioneer farmers first broke the land. Nutritionally, Kernza is much higher in protein than traditional wheat. It also provides double the level of omega-3 fatty acids; more than five times the calcium; and roughly 10 times the folate of annual wheats. Small, light seed size is its biggest drawback. When researchers here first started working with it in 2014, seeds were weighing in at two grams per 1,000 seeds. They’ve since more than tripled in weight. In the field they are now harvesting about 1,200 kg/ha, which is equivalent to about 20 bushels per acre. That still falls far short of conventional wheat yields at 50 to 80 bushels per acre, but the fact that it is a perennial compensates for the lower yields by way of lower production costs and soil improvement. “We still have a long ways to go, but we’re getting there,” Cattani said. He believes the crop has potential for use in conventional as well as organic cropping systems. This article was originally published on the Manitoba Co-operator.